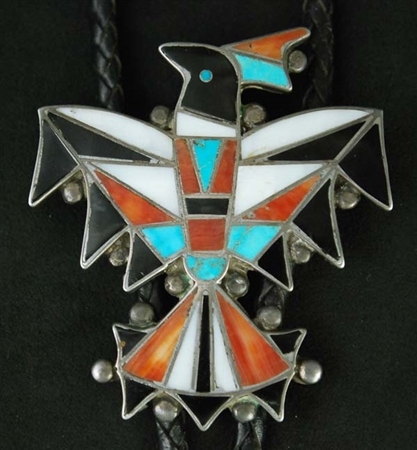 This beautiful vintage bolo tie is handcrafted Zuni work. Hand tooled silver work with precisely set inlay of abalone shell, clam shell, jet and natural turquoise forms a unique Zuni bird figure. The back portion of the bolo has heavy wire loops holding the braided leather cord. 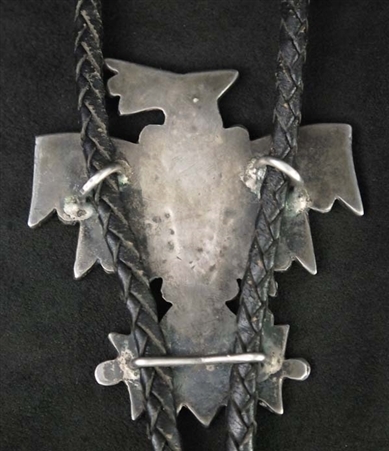 The workmanship, style and age lends itself to the work of artist Frank Vacit. Not hallmarked. The bolo measures 2 1/2" long by 2 1/8" wide. Tips are 2 1/4" long with the entire cord length being 18 1/2" long. The Zuni are known for their fine silversmithing, which began in the 1870's after learning fundamental techniques from the Navajo. Lanyade was the first Zuni silversmith, who learned the art from Atsidi Chon, a Navajo smith. By 1880, Zuni jewelers already set turquoise in silver. Today jewelry making thrives as an art form in at the Zuni Pueblo. Many Zuni have become master silversmiths and have perfected the skill of stone inlay, channel inlay, needlepoint and petit point. They found that by using small pieces of stone they were able to create intricate designs and unique patterns. Their style of work is very tedious and time consuming. Unfortunately many of the Zuni jewelry designs have been reproduced in overseas and are being sold in the U.S. as authentic Zuni jewelry. Buy from reputable dealers and ask for a written guarantee that the piece is American Zuni made.